Our most-decorated semi-regular Tuesday/Thursday-morning rider came out today, fresh from taking the Women’s World CycloCross Championship (50-54 age group) in Louisville Kentucky… that would be the always-classy Karen Brems. I wish I had been feeling good enough to spend time with her and hear the stories, but I’m still getting over this nasty cold bug so nearly all of the ride was, for me, in survival mode. Even though Karen was taking it pretty easy… everyone, in fact, was taking it pretty easy. Everyone? Actually, I don’t know that to be the case. The start of the climb up Kings was easy, until I got dropped, and since Marcus showed up, and Kevin (pilot), and Chris, and George… the regular testosterone brigade… who knows what went on up there. But I do know that Todd, Karen and Eric were taking it relatively-easy. Thankfully it was a no-drop pace of Skyline, else I wouldn’t have got the video of my snot-rocket blessing. I didn’t know for sure that it came my way, yet I had the presence of mind to wipe the camera lens right afterward. One hot ride today! 65 very tough miles. 95 degrees. 90, 95 degrees, who's counting? What better way to prepare for the heat we’re likely to encounter in France than riding up Page Mill Road when it’s 90-95 degrees? Making it especially tough is having Page Mill as the first hill of the day. That’s one mean way to start a ride. Page Mill is one of those hills it’s really tough to get a rhythm on; that bottom section starting just past the golf course/country club turnoff is just plain ugly, and it’s not until you get past Foothill Park that you can really get a handle on it. And that handle is pretty darned slippery, especially between park gates 3 & 4, where it’s gut-wrenchingly steep and you’re thinking why didn’t you go up Old LaHonda instead, an easier grade with lots of shade? Adding insult to injury is Strava claiming I got a personal best on the climb, at 47 minutes. Umm… no. It wasn’t that long ago I did it in 44, and my son probably could have closed in on that time today too, except that he was being relatively-civil and stayed with me all the way up. 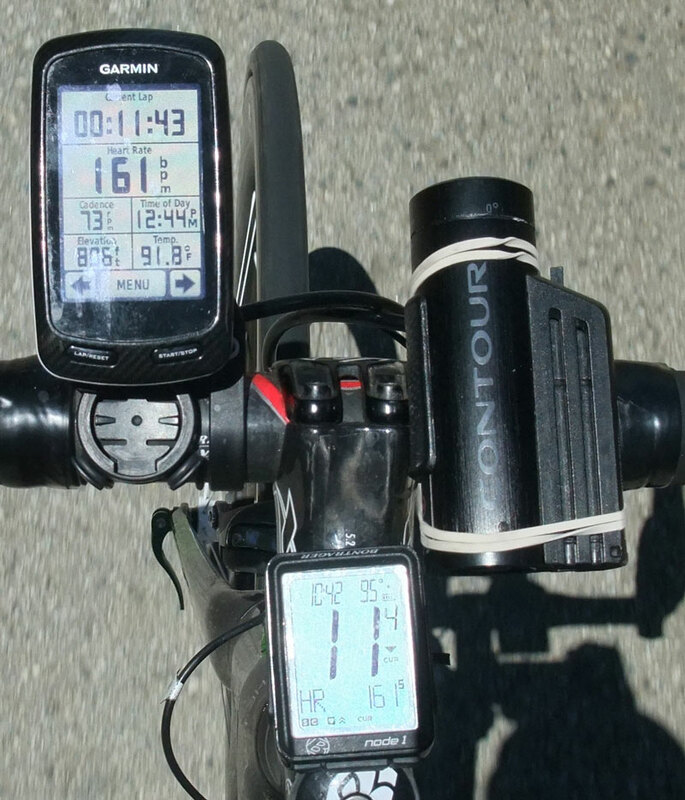 OK, it seemed like it wasn’t that long ago, but since I loaded the last three years worth of data from my Garmin into Strava, maybe it was longer ago than I thought! We wasted no time heading down West Alpine for another date with Haskins Grade, a climb that Kevin claims to hate but is getting much better at, getting his own personal best today at 9:52 despite not climbing it for time. At least not until the last half mile or so when he noticed his time was pretty good and rode the rest hard. Funny how that works. I’d like to say it was a fun run out to Pescadero, but not really; the stiff headwind and heat made it pretty tough. The upside? It’s rare that a cold Coke tastes as good as it did today! Heading north on Stage we once again faced a headwind, yet did pretty good times up the two hills, primarily because motivation was provided by rabbits (cyclists ahead of us). Speaking of rabbits, I should have mentioned we had earlier seen a rabbit the size of a small deer as we rode Arastradero between Alpine and Page Mill. It was seriously huge! 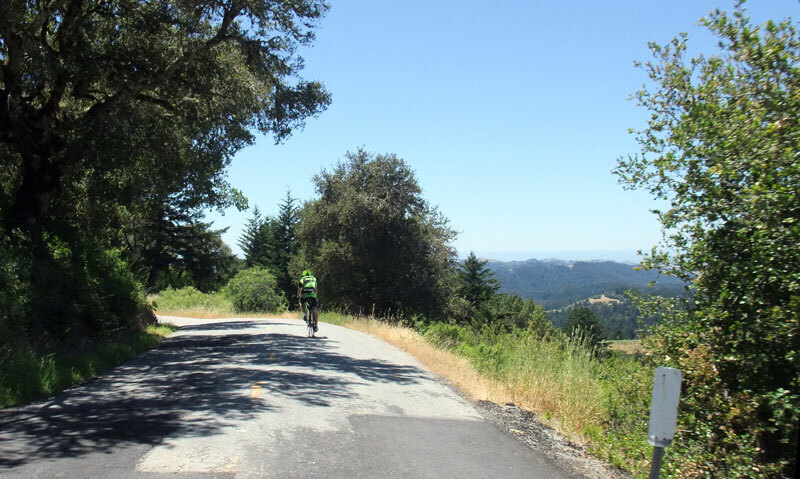 The lower and middle sections of Page Mill proved to be Kevin’s undoing; we’d normally climb Tunitas in 45 minutes or so, but he was barely able to turn the pedals for a while. He can out-climb me dramatically on the first couple big hills of the day, but eventually he wears out and I keep on going. He did a miraculous recovery when the steep stuff ended though, charging the rest of the way at a pretty respectable pace. In the end a tough ride with the unexpectedly-high temps causing a pretty significant weight loss (6.5 pounds for me) due to not drinking enough, even though I tried. Maybe I did drink enough and I burned 6.5 pounds of fat? Don’t I wish!